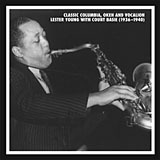 Back in 2009, Mosaic Records issued Classic Columbia, Okeh and Vocalion Lester Young With Count Basie (1936-1940) , a 4-CD boxed set covering four years. When the limited number of boxes pressed sold out, the Young cupboard was bare. Time passed, and now Mosaic has issued a much deeper and broader set of Young: Classic 1936-1947 Count Basie and Lester Young Studio Sessions, an 8-CD box covering nine years. What's the difference? The official explanation is a bit of a muddle, which I won't bore you with here. In short, Mosaic decided to release double the Young thanks to an arrangement with Sony Music, which since 2009 has accumulated more classic labels. For the purpose of this box, think of the Lester Young studio catalog during this period as divided into two large blocks —the Basie years and the period featuring Young as a leader. As a result, we have a box in which Count Basie and Lester Young are together in the first block (95 master sides and alternate takes), featuring Young as a leader or sideman. The balance are 78 sides that featured Young as small-group soloist. This means we have all of the Count Basie Decca sessions (regardless of a solo by Lester), including Young's first recordings with Jones-Smith Incorporated; a Sammy Price session for Decca that includes Young; the Keynote label (the Lester Young Quartet and Kansas City Seven sessions); Commodore (the Kansas City Six sessions); Mercury (the 1946 Young-Cole-Rich session), and all the dates led by Young on Aladdin and Philo. Of course, this box is by no means a complete studio discography of Young. Absent are sessions with Teddy Wilson for Brunswick (1937-38), sessions with Billie Holiday for Columbia (1937-41), sessions with Benny Goodman for RCA (1938-40), a session with Glenn Hardman for Columbia (1939) and the Savoy studio dates starting in 1944. Nevertheless, the new box finds Young riding the Basie rocket into orbit as a leader. The question I'm asked most often these days by JazzWax readers is this: Is new box worth it if I already own the first one?" Here's my answer: It depends on what you already own and the jazz adventure you seek, since both boxes feature very different trails. 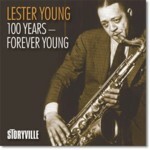 The earlier box featured only Lester Young's solos with Basie, which was efficient and charming. If your mission was to hear the rise of Young in four compact years during the crest of the Swing Era, the earlier box did the job, though the period covered was brief at four years. The new box is a different trip. Here, you have all the recordings by Young with Basie (including vocal dates) between 1936 and 1939, which in some ways merely serves as the appetizer for the majestic work to follow between '39 and '47. During this period, Young was featured in tighter groups where the sound of his saxophone and his radical new style were more clearly pronounced and left uninterrupted. Swing as orchestral dance music began in the early 1930s with African-American bands led by Jimmie Lunceford (above), Fletcher Henderson, Chick Webb and others. The music crossed over to the mainstream mid-decade thanks to the rise of network radio and exceptional white dance bands that appealed to young white audiences. Starting in '36, Count Basie was the most significant exponent of the Kansas City swing school, relying heavily on the blues and riffing sections of the orchestra, with songs often building to a raucous, explosive finale. Basie's band featured many instrumental stars, but Young was the most unique and distinct of the bunch. To fully appreciate how radical Young's more relaxed and nimble attack was, you'd have to listen to other saxophonists of the era, who tended to play gruff and growly. Instead of using the tenor saxophone as a shovel to dig out a solo, Young preferred a more horizontal approach when improvising, coasting along with dexterity and a more laid-back, airy and lyrical approach. In this regard, he mirrored the breathy, pained sound of the female blues balladeer, particularly Billie Holiday. So what we hear in the early part of this box is Young's emergence as a highly articulate soloist and blues storyteller, and Basie's evolution as a Kansas City exponent and competitive national dance band. In the second part of the box, we hear Young's breakout and evolution from smokey Basie flavoring to an eloquent superstar. Personally, I most enjoyed starting with the later period and backing into the Basie material. This starting the Young adventure with the 1942 trio session with Nat King Cole on piano and Red Callender on bass. 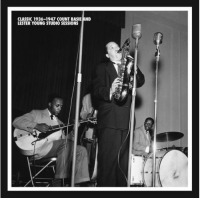 Among the fascinating sides recorded that day is Body and Soul, which lets you compare Young's approach with that of Coleman Hawkins, the saxophone's other titan. 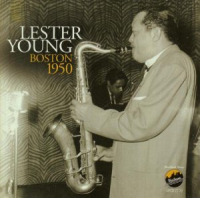 Once I hit the end of Young's small group sides—the Lester Young and His Quartet session of Dec. 19, 1947, just before the start of the second musician's union recording ban of 1948, I shifted to the Basie material, which charts Young's rise. It's more fun this way, since you have a fuller understanding of what Young added to Basie's sound and popular excitement. The careful listener of this box not only is treated to the rise of a new influential saxophone force but also the unintended feminization of jazz. Up until Young, soloist played hot and pushy. That was their appeal. Young advanced a take-your-time tenderness and sensitivity that prior jazz artists didn't seem to exhibit. Instead of an up-and-down vertical attack on the instrument, Young seems to be polishing the music, coasting along with long, airy strokes. What you realize with this box is that Young was streamlining jazz, providing aerodynamic curves that hadn't yet existed. There's joy in every side. JazzWax tracks: You'll find Mosaic's Classic 1936-1947 Count Basie and Lester Young Studio Sessions here, available now for pre-order and available at the end of September.